Do Blinx fit all children's glasses? Please note that Blinx are NOT SUITABLE FOR CHILDREN UNDER 36 MONTHS due to choking hazard. This product is not a toy. Children should be supervised with Blinx that are not fitted to their spectacle frames. Blinx fit approximately 85% of children's glasses. The insertion area measures 8mm by 2mm, enabling them to fit arms of these measurements or less. Even if the arm is very slim, as is often the case with metal frames, the silicon grips to the arm and also to itself, keeping the charm in place. The photograph below shows a very small pair of children's frames, just 11.5cm wide, with slim arms. The charm fits such glasses without movement. Please be aware that depth also plays a factor though - if the arm is very slim and also very flat, the charm will fit, but may not grip and wobble on the frame. Glasses in this category often have a broader hinge area though, such as the hinge shown on the photograph below. If your frames are too thin and flat to hold Blinx along the arm, you may find that they fit securely over the thicker hinge area. If the arm of the glasses is 7/8mm and also very deep, you may find that the charm will only slide part way along the arm, as shown in the photograph below. For glasses that are a little wider, elastic bands will be provided with all Blinx. Simply use these to attach the Blinx to the arm of your glasses. 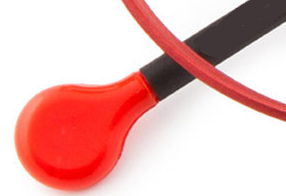 Please also be aware that children's glasses also sometimes feature unusual shapes at the ear end of the arm, such as the spectacles shown below. In order to slide the Blinx onto the arm of your glasses, such endcaps must also measure 8mm or less. How do I fit Blinx to my child's glasses? Blinx simply slide onto the arm of the spectacle frame. Please ensure that the arm is held firm when sliding Blinx on or off, to avoid damaging the arm. If the arm is too wide, you can use the provided elastic bands to attach the Blinx. Will Blinx cause damage to spectacle frames? Blinx charms will not cause damage to your spectacle frames, however, reasonable care must be taken when sliding the charms on/off to ensure that you do not bend, distort or loosen the arm on your glasses. This is especially true for wider arms where the charm fits more tightly. Please ensure that the arm is held when sliding Blinx on/off, rather than the front of the frame.